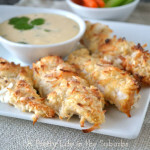 Crunchy Coconut Chicken Bites with Thai Mango Mayo. A quick and easy chicken recipe that’s delicious and healthy! Crunchy, coconut-y and tasty. Cut the chicken breasts into strips (about 3 inches long), and place them into a shallow dish. Sprinkle with salt & pepper. Set aside. Using a hand blender, cream the coconut milk until it is nice and creamy, then pour the coconut milk over the chicken, and gently stir to coat it. Cover and refrigerate the chicken for about 1 hour. Longer is fine too. In a bowl combine the shredded coconut and rice flour. Set aside. Combine the mayonnaise, chili sauce, Thai mango sauce, lime juice and cilantro, and refrigerate until you are ready to use it. Line a baking sheet with parchment paper and a wire rack. Once the chicken has marinated, dredge the chicken pieces in the coconut/flour mix. Gently shake any excess coating off, then place the chicken onto the wire rack on your baking sheet. Continue until all the chicken pieces are coated. Bake for about 12 minutes on one side, then turn the chicken over and bake for about 12 minutes more, or until the chicken is cooked through and the coconut coating is toasty brown. Serve the chicken bites with the Thai Mango Mayo and enjoy!